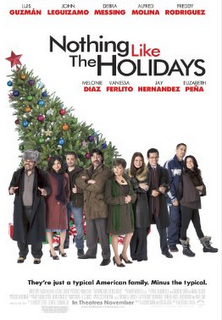 Last night Alex and I decided to go to the movies and see "Nothing Like the Holidays." Well, Alex and I walked into the theater a bit late and were shocked to find it completely empty! There were no people in there! No love for the hispanic movie. It was okay...we were able to sit where ever we want and talk and put our feet up on the chairs. It wasn't the best movie ever or anything, but we enjoyed it. It was exactly what we needed. Alex even busted out his famous laugh...you Miami people know what I'm talking about. Now I'm really pumped about being in Miami for Christmas. We will see you soon! P.S. Luis Guzman is hilarious.